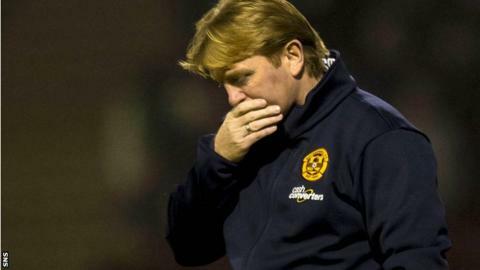 Stuart McCall is confident his Motherwell side will bounce back from the heavy home defeat by Celtic. The 5-0 reverse at Fir Park follows last weekend's Scottish Cup exit at the hands of League Two outfit Albion Rovers. However, McCall insists his players will regroup ahead of their next league game at Ross County. "We'll knuckle down and go up to Dingwall next week and hopefully put this to bed," he told BBC Scotland. Celtic took the lead through Kris Commons just before half time and added four more in a bruising second half for the Steelmen. Following on from their Scottish Cup exit, McCall remained stoic after a heavy home defeat. "Celtic were terrific and there's no doubt about that," said the Motherwell boss. "But, coming up to five minutes before half time, for all the good play they've had, I don't think they've had any outstanding chances. "We were digging in and getting blocks. But they've got quality players and boys who can bring it out from the back. And they're playing with a lot of confidence. "The biggest disappointment was the second goal from a set-piece. If you get cut open, which Celtic did many times to us, then you've got to hold your hands up. "But it was a bread and butter corner and we don't pick up. Ambrose scores and thereafter they just picked us off at will and showed what confident form they're in at the moment. "That's probably as strong a Celtic side they can be at the moment. They've got players playing at the top of their game. "No disrespect, but in the next couple of games we're not going to come up against Celtic. So it's down to us to knuckle down and prove we can be in the top three or four and that's what we'll aim to do. "We'll knuckle down and go up to Dingwall next week and hopefully put this to bed. Last week has gone and tonight was a difficult one to take. "But I think sometimes you've got to put your hands up and say we were up against a really good side. "There's things we can do better, there's no doubt about that. You don't want to get beat at home like that, but we've got three or four games coming up where we need to hit top form."